Most of us know WordPress as a blogging platform or full featured CMS, capable of being transformed in many different ways. But did you know that you can even turn WordPress into your own social network? It’s called BuddyPress and it’s a plugin that extends WordPress to give you all the components needed to create your own social network and online community. In this article, I will take a closer look into all the goodness that BuddyPress has to offer, including a variety of suitable themes. I will also show you a working demo and just how easy it is to manage your own community. Why Should You Use BuddyPress? You could try to launch ‘The New Facebook’ and aim for a gazillion dollar valuation, but maybe that’s a bit far-fetched. BuddyPress is intended to setup a dedicated community for something like your campus, company or even family. It is not only useful for small communities where you know each member in person, you can easily run a community with thousands of focused members, interacting with each other in very sophisticated ways. An excellent example of BuddyPress in action is Shift.ms, a social network for those diagnosed with Multiple Sclerosis. In this network, users share their knowledge, ask each other questions or just offer support in difficult times. The combination of WordPress and BuddyPress makes it a perfect resource for providing useful information with a variety of ways to interact. Another reason to use BuddyPress is the community of active users and developers. And because BuddyPress (like WordPress) is open source, there are lots of great people constantly making BuddyPress even better. What Do You Get with BuddyPress Out of the Box? 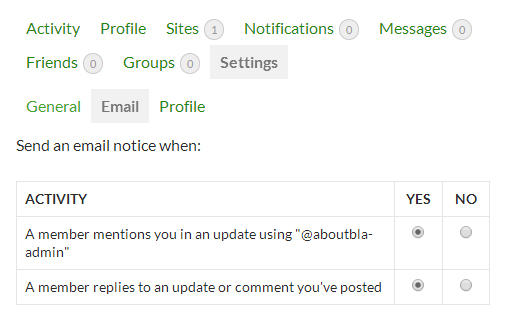 This one goes a bit further than the regular WordPress account settings, especially when it comes to notification settings (note: The screenshot provides only a small portion of the available settings). This one we all know from Facebook, where you can keep track of your friends. A perfect way of communicating in a less social and more personal manner. Comparable to a Facebook Timeline, this is where you keep track of your connections, group mentions etc. A full site stream is also available, like the one on Shift.ms. This one comes with both a toolbar and a dedicated Inbox, as well as being informed by email. Even more dedicated focus groups within your community, which allows for separate activity streams and member groups. Again Shift.ms has this worked out very well. Specify a page where you can keep track of new sites (when in MU mode), posts and comments across your site/network. Additionally, you can also easily set up a forum. There are only a few small steps needed to get it running, here’s a simple example of this in action. If you’re already familiar with WordPress itself, you will find managing BuddyPress is a breeze. For example, making groups is pretty straight forward when it comes to the settings but still offers you enough options to work with. 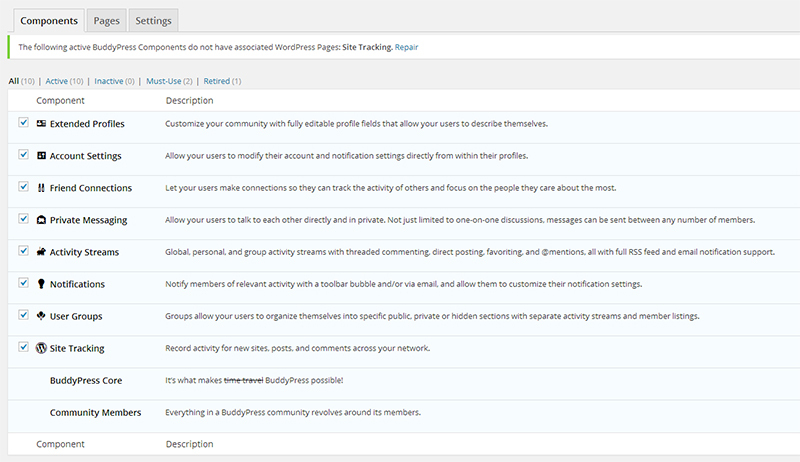 You can manage the activity streams as if they were comments, and look after members in the regular user system. Sometimes it’s just a matter of different naming, but this definitely lowers the bar for using BuddyPress. BuddyPress itself is a platform and wouldn’t be as popular as it is today if you couldn’t build upon it with tons of different plugins and customize it with themes. At the time of writing there are 548 plugins specifically for BuddyPress. You can also use many of the standard WordPress plugins for your BuddyPress site, but it largely depends on its use. BuddyPress itself is already a plugin with customized functionality, you need to make sure if you install another plugin that it will integrate with BuddyPress too. In most cases it’s just a matter of checking the plugin documentation or testing it out for yourself. Most of the popular WordPress plugins offer BuddyPress integration. Also, it’s good to know that the blog functionality of BuddyPress works with all of the standard plugins, as this is a normal WordPress blog. BuddyPress works with any theme that runs on WordPress. But, that doesn’t mean you shouldn’t consider using a dedicated BuddyPress theme. Why? Well, as with most advanced customisations of WordPress it is sometimes better to use a dedicated theme to allow for specific functionality. Take WooCommerce stores for example: Regular themes are fine, but if you want to make full use of this plugin you are sometimes better off using a dedicated e-commerce theme. It just has a better layout, and makes sure the custom functionality (like the activity stream for example) is presented in the most convenient way. A perfect example of a dedicated BuddyPress theme is Community Junction. 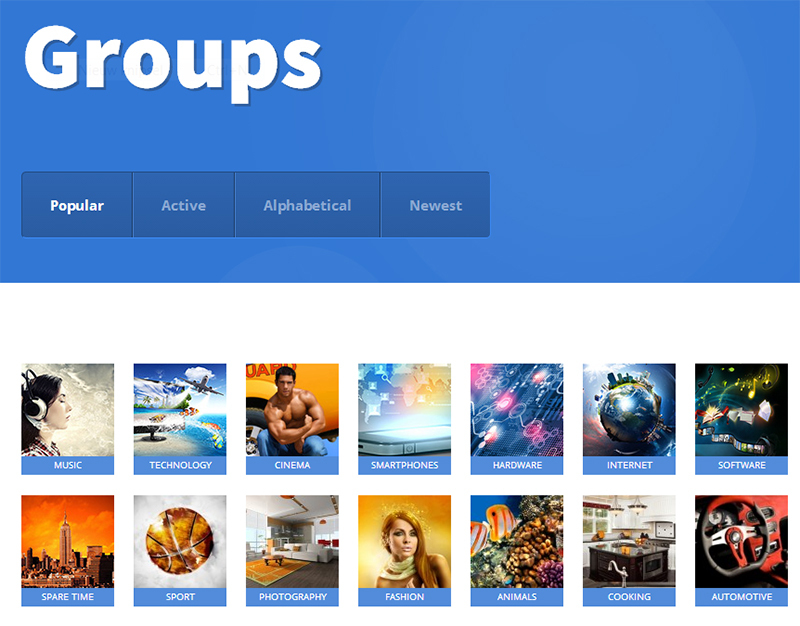 It has all important BuddyPress features in its navigation, and the way they worked out the Groups section is really amazing. Some themes take a different approach, by fully integrating BuddyPress into the theme itself. Another good example for an integrated BuddyPress theme is Made. It combines both WordPress and BuddyPress functionality on one page, including widgets on the right. This theme takes your regular WordPress installation to a whole new level, and they managed to have BuddyPress fit in perfectly. BuddyPress can have many different faces due to its extensive customization options. Now let’s review some real world examples. I’ve already mentioned Shift.ms in this article but it’s definitely worth another mention. You wouldn’t even know it’s running on BuddyPress unless you looked at the code. Not only did they customize the theme, they also did some renaming of certain labels. The activity stream is called “What’s going on”, and the “Speakeasy” is what they call their forums (which is an excellent name if you ask me). I also like the way they use the custom profile fields to filter very relevant information for their members. VentureCapital4Africa has a BuddyPress installation running which they have heavily modified to suit their needs. The “Ventures” section is a good example of this. 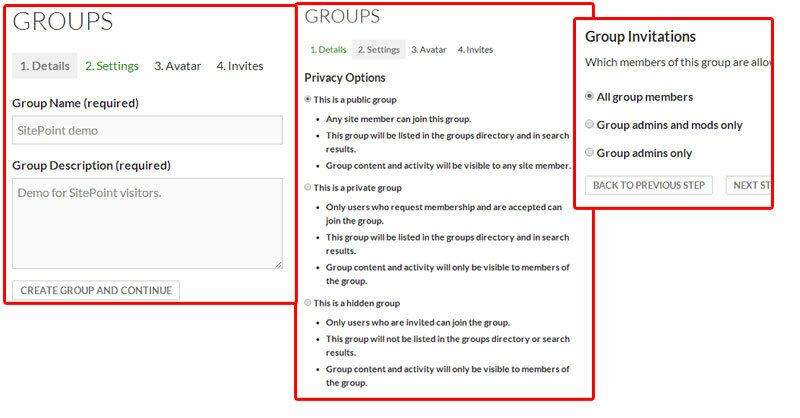 These are basically Groups which they have modified with additional fields like “Summary Plan” and “Members” (which is nicely done as well, since these are regular member profiles). It is a good example of making extensive use of BuddyPress’s capabilities. If you’re looking for more examples, WordPress.org maintains a BuddyPress showcase that lists lots of examples of BuddyPress powered communities. As you can see, BuddyPress is much more than just a way to add interactivity to your WordPress site. Its default features easily allow you to build a professional community. Combine this with the many (many!) ways you can customize BuddyPress and perhaps you could have the next Facebook after all? You can learn more about BuddyPress at BuddyPress.org.